Small finely crafted pictures were often made to be held and their detail pored over. This tour de force of virtuoso ivory carving was made in Bath by the celebrated G Stephany and J Dresch. Originally from Germany, the pair specialised in miniature carvings of breathtaking and scarcely believable intricacy. Stephany and Dresch were described as ‘the most eminent sculptors in ivory in Europe’. 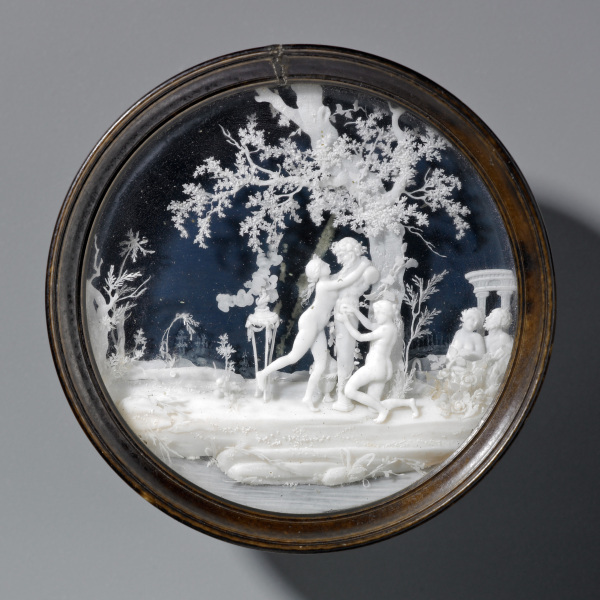 Their extraordinarily intricate pieces, ‘so fine that a glass is necessary to discover its beauties’, attracted royal attention and they were soon describing themselves as ‘Sculptors in Miniature on Ivory to their Majesties’.